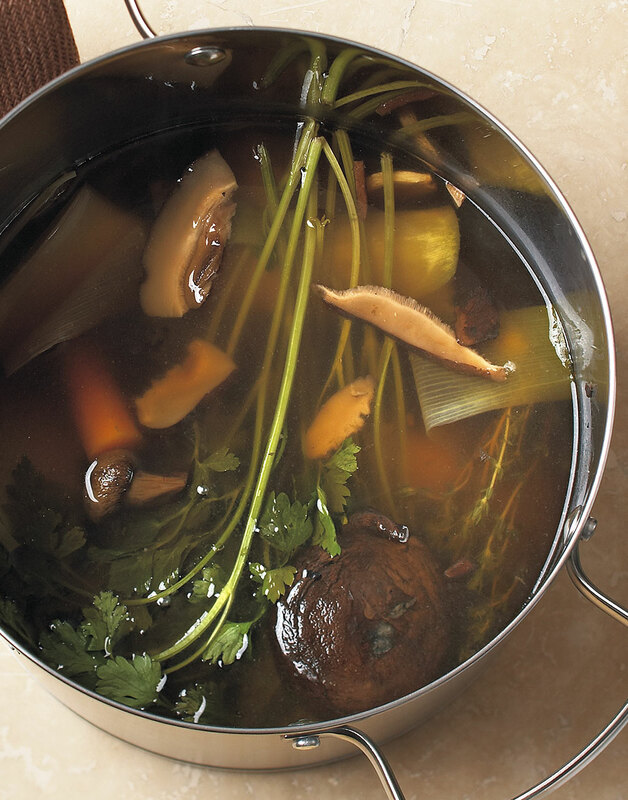 Mushroom stock may not grace the pages of culinary textbooks, but we love its versatility. Its earthy flavor complements pastas, Asian dishes, and classic French foods. And it employs a method similar to that used to make Beef Stock, but it’s portobellos instead of bones that we’re roasting. This enhances the flavor of the mushrooms and the flavor of the finished stock. Dried shiitakes add pronounced mushroom flavor. If you can’t find them, substitute any variety of dried mushroom. You also could substitute nearly any fresh mushroom you like in this rich-tasting stock. And be sure to check out our primer, How to Make Homemade Stock. Sherry enhances the flavor of the mushrooms, but a dry red wine is an acceptable substitute. Toss portobello and button mushrooms with oil; roast in a roasting pan until browned, 30–45 minutes. Transfer mushrooms to an 8-qt. stockpot; drain and discard any excess grease. Add carrots, leeks, dried shiitakes, parsley, thyme, garlic, and bay leaves to stockpot. Place roasting pan on the stove top over medium-high heat. Deglaze roasting pan with sherry, scraping up brown bits. Pour sherry and brown bits over mushrooms and vegetables in stockpot. Add cold water to cover contents of stockpot by 1 inch. Bring stock to a simmer over medium heat. Simmer stock 1 hour. Using a fine mesh sieve, strain stock into a bowl; discard vegetables. In an ice bath, cool bowl of stock to below 40°. Cover stock with plastic wrap; refrigerate. To keep the stock from looking dirty, use a teaspoon measure to scrape away portobello gills. As the mushrooms roast and caramelize, they shrink and their flavor intensifies.